I recently received this DM on Instagram and thought it would make a great question for my new monthly blog series: Community Questions. It’s as straight forward as it sounds - I take your questions and answer in a blog post à la Dear Abby. I’ll be keeping everyone’s identity anonymous for this column and will default to gender neutral pronouns (they/them/their) if needed. “I’d love to hear more about what helped you during recovery from your eating disorder, and I guess the same question for recovering during your (postpartum septic blood) infection. I’m currently working part time, going to school full time, in recovery for an eating disorder, while trying to grieve the loss of my older brother, and my mental health is really really struggling. I’m in the process of finding a counselor and I got your Redefining Success Journal but I can’t seem to eat enough on any consistent basis despite the best of intentions and I’m experiencing a lot of physical dis-ease symptioms that are creating major anxiety. So I’d really love to see some more blog posts on this or if you have any suggestion for me, I’d be so grateful. Thank you so so much in advance. First, thank you for trusting me with your story & experience. It’s an honor to know that you feel safe enough to reach out to me, and I’m so proud of you for asking for help during this time. I’m so sorry to hear about the loss of your brother. I know how disorienting grief can be, and I imagine you must be processing a lot. I can imagine you must be feeling really exhausted and overwhelmed. I know personally when I’m feeling those things, missing meals is common and easy. I know how much energy it takes to eat nourishing meals all day during times like this, and even 15 years after my recovery, it’s still hard. You’re definitely not alone there, A. These are some things I do now to help stay nourished when I’m feeling overwhelmed. I’m also going to share some things I did to reclaim a sense of pleasure from food while I was recovering from my eating disorder 15 years ago. Truly the only way I manage to eat enough in the day is by having meals pre-made. This might sound exhausting given how full your schedule already is, but consider just starting small and building slowly. Making a big batch of broth, soup, stew, congee, or dhal requires a bit of prep but it’s mostly time on the stove/crockpot/instantpot. Dishes like this freeze well too which is a great bonus. You could double a batch and freeze half for the coming week. You can also check out this post where I talk about food prep instead of meal prep at the start of the week. This would require being home to cook a bit, but it drastically saves time. My best tip for planning ahead: pick 1 day per week, which is the same every week, when you handle meal/food prep. In our house, it’s Sunday. We do the bulk of our grocery shopping and make at least 2 dishes for the week and it saves us so much energy during the week ahead. Broth is my go to when I’m having trouble eating. It’s an easy to consume, easy to digest, nutrient dense option that can travel with you in a thermos. I like to drink broth like a warm tea which makes it feel a lot easier to consume than a full meal. When I don’t have an appetite, it’s easy to get down and keeps my body from being too empty. Get my recipe for Humble Luxury Bone Broth here. I share simple ways to scale the recipe up and down based on your budget & needs, plus directions to make it on the stovetop, in the crockpot, or in an instant pot. When I don’t have an appetite, the last thing I want is a big plate of food - especially cold food like salad. 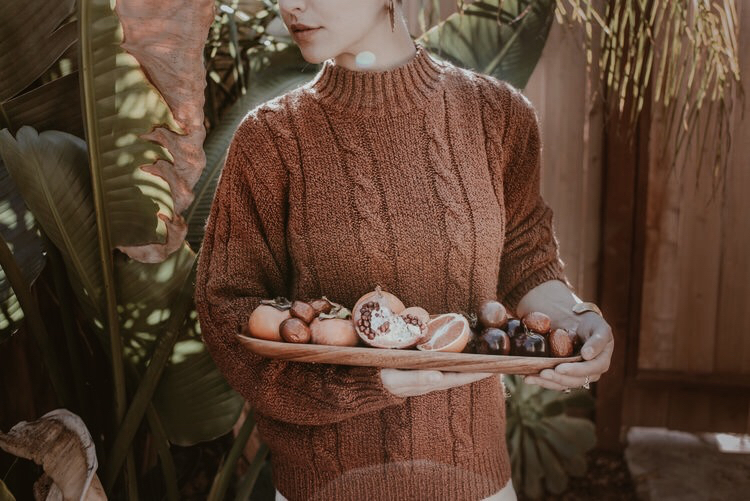 During times like this, when grief & overwhelm are taking center stage in the body, easy to digest food can help you stay grounded and nourished. Focus on slow cooked, warm foods like broth, soup, stew, congee, and dhal. • Postpartum Foods! This is a time when people need to eat warm & easy to digest meals so if you look for traditional postpartum recipes, you’ll find things that are also great during times of trauma & healing. The First Forty Days by Heng Ou is a great cookbook covering postpartum meals. • Traditional Chinese Medicine (TCM) Spleen Qi Meals & Foods | These meals will also be easy to digest and warming. If it’s accessible for you, I’d recommend purchasing some kitchen appliances to make cooking easier. Things like a rice cooker (which you can get for under $20) and a crockpot or instant pot can make the process of preparing easy to digest food a lot easier. It’s easy to feel like everything needs to be done now. I’ve come to know that health is #1. Nothing else can happen if we’re not healthy. I mean, it can for awhile, but eventually that road runs out. It’s not sustainable and it feels awful in the process. Is it possible to remove something thing or things from your plate, A, to focus on your health right now? Maybe a sabbatical from school? Even 1 semester? I know it’s not accessible all the time to make space in a busy schedule, but trade offs are inevitable. If you’re finding it difficult to make space, consider this: By not removing something from your schedule, you’re sacrificing something else. What are sacrificing and is it worth it? Is it worth it to stay in school at the detriment of your physical & mental health? Explore what’s most essential to you, what you’re not willing to sacrifice, then make the difficult decision that will support you in focusing on those essentials. If you’re looking for more help understanding and integrating the process of finding what’s essential, I recommend reading or listening to the audiobook of Essentialism by Greg McKeown. He goes deeper into the concept of trade offs and the practical how-to process of living like an essentialist. Pleasure can be small and simple. When I was recovering from that infection during postpartum, the small whispers of pleasure saved my life. It was, for me, the smallest things like a fresh flower, the flicker of a candle, the smell of lavender. All of these littles moments gave me a breath of pause to remember the joy of being alive and the beauty thats here, even though I felt so far from that joy and beauty. Every little moment of pleasure reminded me that there’s something to fight for, that there’s a reason I’m working so hard to get better. In The Redefining Success Journal, one of the activities is to define what pleasure looks and feels like to you. I recommend doing that exercise, then making space to savor and feel those big and small moments of pleasure. Most often, I find it’s simply about opening our eyes to what is pleasurable to us and remembering to notice it. One of the things I did while I was recovering from my eating disorder was to view food as a form of creative expression. There are so many different colors, textures, and shapes that food can be. When I began looking at food as a creative medium like painting or sculpting, it totally changed my experience of interacting with meals. The process of cooking became one of exploration and self expression. It helped me claim my identity and value, which is massive when recovering from an eating disorder. Plus, art is subjective. Everyone likes different art and different mediums and, one piece can tell many stories based on who is viewing it. Applying that same mentality to my food totally shifted how I felt about eating. This outlook helped me meet my meals with a sense of curiosity, searching for the inspiration and expression, rather than meeting it with shame and self loathing. Another thing that radically shifted how I view and experience food was focusing on growing my own. Tending to a garden felt like tending to my body. As my little baby seeds grew to sprouts, then to flowers, then to food, they reflected to me all the potential inside of my own body. As they grew, so did I. Plus, the process of raising food from seed to table was an experience that made me feel so joyful once it came time to cook. If it’s not possible to start a garden right now, consider searching for a way to shop locally. CSA or Community Supported Agriculture is usually an affordable way to buy local produce. It helps farmers plan for the season ahead. Plus, farms are often open to letting you come help harvest once or a few times during the season in exchange for a big box of food. Check out your local farmer’s market and ask around to see who offers CSAs. Focusing on local eating was one of the first steps I took during my recovery. When I was a freshman in High School, I read a book called Plenty : One Man, One Woman, and a Raucous Year of Eating Locally by J.B. MacKinnon and Alisa Smith and it cracked my mind open to what’s possible in the kitchen. This was the inspiration that lead me to view food as a form of art and it showed me how interconnected food is to the Earth. It made me feel less alone and reminded me of all the many lives that have lived, and cooked, on this planet. Learning to cook something new is a great way to shift your focus from shame & loathing to value & pride. It may take some time to master your skill, but once you do, wow! What a feeling! This is great way to build self esteem and joy in the kitchen. From simple skills like proper knife skills to more complex things like tempering chocolate, learning a new skill can be a huge boost to your confidence. That’s really how I learned to bake, which lead to do it professionally for quite a few years. You may be surprised what your skill brings into your life! And, if you don’t have time to learn a new skill, consider just watching some food shows. I’ve found a lot of inspiration watching other people use food as art. The Great British Baking Show is a great option since it’s so kind and sweet (pun intended). Hope that helps your recovery, A, and anyone else who may find value in these words.